By a happy accident of timing, just as "Storm Doris" was heading for the UK last week, I was sneaking off to sunny Madrid. I was invited by the University of Madrid CEU to talk about the revival of interest in Golden Age fiction, and kick off their latest Congress focusing on G.K. Chesterton, but also covering Agatha Christie, Georges Simenon and other greats of the genre. This was quite an honour and slightly daunting, not least because I'm rather overwhelmed with Things to Do Urgently this year. So I did hesitate about accepting, but in the end I agreed, and boy, am I glad I did. It was a great trip, splendidly organised, and I must give special thanks to Pablo Carreras for setting everything up so pefectly. In case anyone is wondering, my mastery of the Spanish language is non-existent, so I delivered my lecture in English. I was pleased by the range and quality of questions from the audience, several of which were truly thought-provoking. And I was also glad to meet some very interesting people, not least the second speaker, Dominique Meyer-Bolzinger, an expert on Sherlock Holmes amongst other things. Pablo also organised a terrific lunch which, in true Spanish style, lasted a long time, and was highly convivial. I'd arranged to meet, for the very first time, a Facebook friend, Jose Ignacio Escribano, who blogs at A Crime is Afoot. Although I have some reservations about Facebook, it is a wonderful way of connecting people who are geographically separated, and it was a delight to meet Jose Ignacio. He took me on a tour of Madrid, including second hand bookstalls and the atmospheric Cafe Gijon. It's always fascinating to get an insider's view of a place. We parted quite late in the evening after a day that had for me been rather memorable and hugely enjoyable. As I went back to my hotel, I reflected that when I was working full-time as a lawyer, it was impossible for me to take part in events such as the Congress (not that I was invited to many, to be honest!) I feel very fortunate that my career has moved in the direction it has. And to be invited to talk about the Golden Age by a university in a country where, perhaps because of the political climate in the era of dictatorship, the detective genre didn't really flourish until modern times, really was quite something. . I've often extolled the virtues of Henry Wade on this blog, and my Forgotten Book for today is one of his later, less well-known efforts. Be Kind to the Killer was published in 1952, and it's another example of Wade's admirable determination never to write the same book twice. It's a police story, but his regular cop Inspector Poole doesn't appear (although Sir Leward Marradine plays a minor part), and the focus is on post-war London gangland. Wade was, in other words, trying to move with the times and adapting his material and storytelling style accordingly. The book opens with the conviction for murder of a cop killer, who is spared the gallows because of a recent change in the law. At first, I wondered if the story would dwell too much on arguments in favour of capital punishment, but this proved not to be the case. Wade's attitudes come out quite clearly in his fiction, but he wasn't a didactic writer. The dead cop's friend and colleague, Campion (was this choice of name a hat-tip to Margery Allingham's famous detective? I can't believe it's a pure coincidence), determines to find out if there's any truth in the suggestion that someone else was involved in the crime. The official police investigation has turned up nothing, so he embarks on a rather risky freelance operation, enlisting the support of the dead man's widow. After a slow start, the book perked up, and I found myself increasingly interested, despite my general reservations about crime novels written by genteel English authors about gangsters. As usual, Wade's account of police procedure has an authentic feel, and the characterisation is good enough to keep us interested in Campion's fate. This doesn't rank with his masterpieces, but I enjoyed reading it. There is a relatively recent film called Serena, but the Serena I'm discussing today dates back to 1962, and stars Honor Blackman, shortly before she rose to fame in The Avengers and Goldfinger. It would be easy to say that she is the most memorable feature of the movie, but that wouldn't be quite fair to the story, which is a nifty mystery, and the work of Edward and Valerie Abraham, presumably a husband and wife duo who were apparently responsible for several crime scripts in the 60s. Reginald Hearne, an actor who plays a minor part in the film, also contributed to the screenplay. At the start of the film we see Howard Rogers, an artist, played by Emrys Jones, embracing his glamorous model. She leaves his studio just as the police arrive. Two rather dour cops, played by Patrick Holt and Bruse Beeby, start asking pointed questions about what Rogers has been up to. He has been out shooting with his model friend Serena, he explains. Things get tricky for him when the police tell him that his wife appears to have been shot. Will his alibi hold up? The plot complications come thick and fast thereafter, especially when Blackman comes into the story. This is an ingenious puzzle, very much in the spirit of the Golden Age, despite a few early Sixties trimmings. There are, I think, obvious flaws in the murderous scheme if one thinks about the case coolly, but the pace of Peter Maxwell's direction means that one doesn't have too much time to spot them. Blackman apart, the acting is not spellbinding, but I enjoyed seeing John Horsley, who had the wonderful role of Doc Morrisey in The Fall and Rise of Reginald Perrin, playing a solicitor. Johnny Gregory's jazzy theme tune is also very appealing. Blackman apart, though, the real strength of Serena lies in its twisty plot. And right at the end, a very neat clue is revealed. SS-GB, one of the most renowned books by the justly renowned Len Deighton, was first published in 1978. The first episode appeared on BBC TV tonight, so it's taken a very long time to reach the screen, but it was definitely worth the wait. We were treated to a gripping, multi-layered storyline, packed with action but also including scenes that were poignant. The premise is that Hitler won the Battle of Britain, and the action takes place in 1941 with the Germans in control of London, while a Resistance movement fights a desperate but apparently hopeless rearguard action. 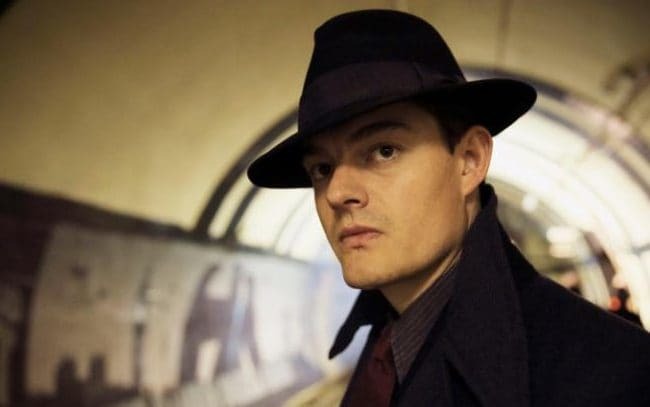 Superintendent Douglas Archer (Sam Riley) is called to investigate the murder of an elderly man in rather peculiar circumstances. A mysterious American woman approaches the scene of the crime, and Archer discovers that she is a journalist. But her interest in the crime is puzzling. Archer is conducting an affair with his secretary, who is involved with the Resistance movement. He is a widower with a young son, and by the end of the first episode, his son's safety is under threat. He is also troubled by the arrival of a tough German police boss, which suggests that the murder he is investigating has sinister and far-reaching ramifications. Part of the reason why I found this episode gripping is that the authors of the script, Robert Wade and Neil Purvis, have mastered the large-scale thriller, having written several James Bond films. And the acting is excellent. But the greatest strength is the source material. Along with John Le Carre, Len Deighton defined the British thriller in the second half of the twentieth century. He is a very exacting writer, and there is a depth to his work that one simply doesn't find in the majority of thrillers. I am very much looking forward to future episodes of SS-GB. The British Library has done crime fans a service by republishing Raymond Postgate's admirable crime novel Verdict of Twelve, but today I want to talk about that book's much less renowned successor, Somebody at the Door, first published in 1943. It's a story which shares some features in common with its predecessors, and again Postgate uses fiction to illustrate his belief that our personal histories determine what happens in our lives.. The story begins at Euston Station, one Friday evening in January, 1942. A cashier called Grayling, who also serves on the local council at Croxburn, is travelling home with a suitcase full of cash - wages to be handed out to the staff on Monday. Grayling shares a carriage with a group of people, several of whom are known to him personally. That evening, he dies at home, and it becomes clear that he has been the victim of a highly unusual murder. One possibility is that he was poisoned by one of his fellow passengers. Postgate devotes most of the story to a series of accounts of the lives of some of those passengers. Although the killer's m.o. is unorthodox, it seems - amazingly - possible that it may have been employed by a number of people who have motives to wish Grayling harm. For Grayling, it turns out, was a nasty piece of work, a mean-minded hypocrite who was involved in local government corruption (the description of his various scams is quite fascinating). Postgate's radical political views, and his atheism, inform the narrative. No character with conservative attitudes or religious beliefs comes out of the story unscathed. At times the political digressions are over-done, and as a result, of this, and one or two structural flaws, the book isn't as compelling as Verdict of Twelve. It's also a bleak book, not remotely comfort reading. But it's extremely interesting nonetheless, and deserves to be better known. One of the pleasures of the writing life comes from interactions with readers. I find the feedback of those who are kind enough to read my books, and this blog, quite fascinating. Occasionally, as with reviews, the feedback is either eccentric or less than positive, but life is far too short to become unduly disheartened by negativity. I treasure, for instance, the Amazon review of one of my novels which read "not a lot of interest in this as no trains", evidently from a railway lover who was not deterred from purchasing the book despite the complete absence of a promise of train-related material. Naturally, though, positive and constructive reactions warm the heart rather more. I always pay close attention to comments, both positive and critical, from those who are supportive of my writing. As with suggestions from trusted agents or editors, they are well worth taking on board, whether or not one is always fully in agreement. One can always do better. And in another context, I found a comment the other day from Fiona, who has long been a valued supporter of my writing, very thought-provoking. Fiona was commenting on the paperback publication of The Golden Age of Murder, and she asked an interesting question: "do you have any twinges of regret that you are becoming best known as an Authority rather than an Author...any pangs about your characters waiting for you to breathe new life into them?" Well, it's nice to be regarded as an authority, but to ask about twinges of regret is very perceptive. I've often talked about the ups and downs of the writer's life - and Chrissie Poulson's recent blog on the subject was very well received - and the issue underlying Fiona's very good question is to some extent about priorities and focus..
Fiona actually raises an issue which a number of people have raised with me in one way or another. Indeed, some years ago, when I was working on The Golden Age of Murder, someone advising me queried whether it was the right book to write, as the heavy workload involved might prove a distraction. But I carried on with what was really a labour of love. Similar points have been put to me in the past couple of years, and it is all to do with the fact that, at least apparently, I've focused much more on non-fiction during that time - The Golden Age of Murder, my work with the British Library, and The Story of Classic Crime,in 100 Books and so on. I've published various short stories, but no novel since The Dungeon House in 2015 (though I do have a storyline for another Lake District Mystery roughly worked out). My answer, though, is unequivocal. I'll always see myself as a novelist, whether or not my novels are published and read, and whether or not they reach a wide audience. I was publishing non-fiction, though, before my first fiction was accepted, and I've always enjoyed non-fiction, researching subjects which intrigue me, and sharing my thoughts on them. The success I've been lucky enough to enjoy of late -The Times printed a rave review by Marcel Berlins of The Golden Age of Murder at the week-end - has been hugely gratifying. And my feeling, rightly or wrongly, is that all this has been very good for me as a novelist. I say this partly because sales of my books, including the early Harry Devlins, have steadily improved. But also because it's helped to motivate me as a fiction writer. I'm not absolutely sure why that is, if I'm honest, but it is a fact. And right now, I'm feeling rather happy about my fiction for another reason. Over this past weekend, I've just finished the first draft of a brand new novel, quite different from everything I've done before. What is more, I've written it in a completely different way from my approach to all my earlier novels. But is it any good? you ask. I don't know, but I do know that at least the idea which is the driving force behind it is a strong one, compelling enough to have preoccupied me ever since I finished The Dungeon House. At this stage, I've no idea what will happen to the book. My previous stand-alones failed to become bestsellers, to put it mildly. So you could call it a bold or even foolhardy experiment. I can't be sure anyone else will love it as much as I do, but even if they don't, I won't regret having had a crack at the story. I'm not a believer in spending much time on regrets. My enthusiasm for writing fiction remains as strong as ever, and my aim is simple. For as long as I can, my priority will be to combine writing stories with writing about the genre I love. 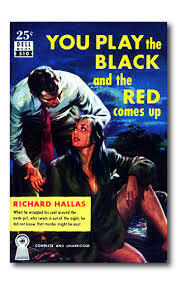 First published in 1938, You Play the Black and the Red Comes Up, is a classic of hardboiled American crime writing. Yet the author, Eric Knight (who originally published the novel under the pen-name Richard Hallas) was an Englishman, born in West Yorkshire. It was his one and only contribution to the crime genre prior to his untimely death in 1943. It's a first person story, and the narrator's wife abandons him in the very first paragraph. He immediately leaves home and heads off to southern California n search of her, and his young son, but to no avail. My main reservation about the story was that, having yearned to find his son, our hero then more or less forgets about the child, as his life takes a dramatic series of turns. This didn't quite ring true, but it didn't spoil my enjoyment of the book. The narrator (an army deserter) gets embroiled in a crooked scheme, but manages not only to escape justice but to turn his ill-gotten gains into a small fortune - by mistake. He still squanders the money on his new lifestyle with a woman called Mamie who is enraptured by his good looks and affable, easy-going personality. He's really not the tortured hero you might expect to find in a book of this kind. This book has its detractors: they include Edmund "Who Cares Who Killed Roger Ackroyd?" Wilson, whose views on crime fiction were so often crass that to earn his disfavour was almost a badge of honour. But it also has many admirers, and I'm one of them. I like Knight's wit, and his ability to take his story in unexpected directions. Oddly enough, he's best remembered as the creator of Lassie, but he deserves to be renowned for his solitary contribution to crime fiction. What a shame he was killed while serving in war-time, when his plane crashed in Suriname. Unforgotten (ITV) and Apple Tree Yard (BBC) are two high profile crime dramas that have both come to an end this week. The storylines are very different, but they have something in common - a focus on cruel and violent sexual abuse. The series also boast superb casts. A curiosity is that Mark Bonnar,a very charismatic actor, appears in both stories. So does Adeel Akhtar in slightly less prominent, but still (especially in Unforgotten, where he excels) significant roles. I was very impressed with the first series of Unforgotten. Nicola Walker and Sanjeev Bhaskar make a pleasing detective duo. Their relationship develops in the second series, in an interesting and believable way. One key difference between the two shows is that Unforgotten is an original TV drama, written by the talented Chris Ling, while Apple Tree Yard is based on a best-selling psychological thriller by Louise Doughty. For the sake of those of you who have not yet seen these programmes, I don't want to go on too much about the plots. But I must say that the effects of cruel abuse seemed to me to be extremely well depicted in both scripts. Emily Watson's performance in Apple Tree Yard is powerful and affecting. Mark Bonnar plays very different parts in the two stories; in Unforgotten he is compelling as a gay barrister whose final discussion with the police proves to be pivotal to the outcome of the story. Overall, though, I felt that Unforgotten was much more successful than Apple Tree Yard. It was longer (six episodes, as opposed to four) but it felt much leaner. In Apple Tree Yard, for all its merits, the characters of the male abuser, the male fantasist, and the husband of the victim seemed shadowy and insignificant; presumably that was the intention, but the narrowness of focus didn't really work for me. In contrast, there was hardly a weak link in Unforgotten. Excellent, well-rounded characters, a clever story, a strong moral dimension, and an ending which - though some might think it unconventional - struck me as finely judged. There were intriguing echoes of famous crime stories of the past in the plot but those elements were blended seamlessly with a first class cold case mystery. If there's a better British TV series than Unforgotten this year, it will be a very good one indeed. 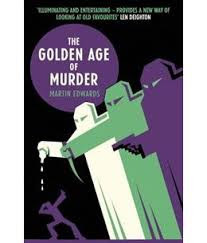 Tomorrow marks a milestone in my writing career, as The Golden Age of Murder appears in paperback in the UK for the first time, not quite two years after the original hardback publication. To say that this has been a lucky book for me is an under-statement. In terms of sales, reviews and awards, it's far surpassed even my most optimistic expectations. I'd never have dreamed, for instance, that it would be translated into both Chinese and Japanese, yet that is exactly what will happen this year. In terms of both the number of reviews and their content, the reaction has been amazing- not just in the UK and US, but also in places such as Sweden and Australia. And I've recently been invited to talk about the Golden Age at literary festivals in such unexpected locations as Madrid and Dubai. During the course of last year, the book picked up three awards in the US - the Edgar, the Agatha and the Macavity, and in the UK it earned the H.R.F. Keating award. For good measure there were two shortlistings - the Anthony award at Bouchercon, and the CWA Gold Dagger for non-fiction (which has never been awarded to a book that was a sort of reference book rather than a conventional true crime book). Attending those events was quite a surreal experience, but extremely gratifying. Equally pleasing have been the shoals of emails and other messages I've had from readers who have enjoyed the book. Of course, I hope the paperback will reach an appreciative readership. And for those people who have asked me how I can follow up this book, my answer is - do look out for The Story of Classic Crime in 100 Books, which the British Library will publish in a few months' time. it's a very different book, but it's also one I'm proud of..
"My father began a trilogy featuring his flamboyant artist-detective Simon Gale with “Noose For A Lady” published by Wright & Brown in 1952, the novel of his BBC eight part Radio Serial Play of the same name. The book was made into a 73 min film in 1953 by Insignia Films Directed by Wolf Rilla which has recently been ‘discovered’ and released on DVD. A second book to feature Simon Gale “Sorcerer’s House” was published by Hutchinson in 1956. A third book “The Snark Was A Boojum!” was announced in the press the following year, begun but due to various personal problems never completed. The murderer based his crimes on selected verses from Lewis Carroll’s nonsense poem “The Hunting of the Snark”. The book was divided into three parts commencing with The Vanishing. Part two was The Hunting, concluding with part three The Snark! There were two versions of Part One of the book, a third person account and a revised version in the first person, describing events seen through the eyes of Jeff Trueman, a guest at Hunter’s Meadow. I read the revised version and immediately understood why my father had made the changes - the story works much more intimately. In 2015, persuaded by Gavin O’Keefe at Ramble House, I resolved to finish it. I began a process of completely revising the story from the beginning, major additions and rewrites for part two, and adding the final part, the solution: The Snark! As I typed up Part One, I jotted down Gale’s character traits by looking up passages in Noose for a Lady and Sorcerer’s House. This also helped me to avoid inconsistency in the writing style, enabling me to adapt or borrow elements of the two books when my father’s pages ran out… Of course, eventually they did run out. It was like travelling along on a train and suddenly noticing there were no more rails ahead. I was suddenly on my own! In moving forward, I also had to go backwards and rewrote most of Part Two, cutting quite a lot out and putting different scenes in to make my plot work. The story wouldn’t let me go, and I couldn’t let it go, because I realised I would never be able to pick it up again once it had gone out of my head. Bit by bit I laid down new track, and inched along it, giving chapters to my wife Jenny to read, in order to get the point of view of someone not down in the cake mix. If it didn’t feel right I worked it again until it did. It was an intense process and I thoroughly enjoyed it. Suddenly, the book was finished, and in the surprisingly short time of 35 days. I sent the completed manuscript to my agent Philip Harbottle with some trepidation on 16th April. The following day Harbottle sent an email to Gavin O’Keefe: “I have some exciting news for you!” Then all hell broke loose! Four days later Ramble House issued a contract, a proof of the book, and a draft of the cover design by Gavin L. O’Keefe! By the 24th April the paperback was on sale at Amazon. That must be some kind of a record." E.C.R. Lorac published The Sixteenth Stair in 1942. As usual, it features her low-key but appealing cop, Inspector Macdonald, and as so often in books written during the first part of her career, it is set in central London. A family called the Hazelys are at the heart of the action, along with a house in St John's Wood called the Villa Eugenie, which has an intriguing history..
Timothy Hazely, an American member of the family, comes to London and is tempted by the stories he's heard to take a look at the Villa Eugenie, which has been left unoccupied for many years, but his visit takes an unexpected turn when at the foot of the stairs, he discovers the body of a man with his neck broken. It turns out that the victim is a member of the family. The house may not have been lived in for a long time, but it hasn't been entirely deserted. Macdonald and his team soon find out that it has been used as a rendezvous for an illicit love affair. A doctor has become involved with one of his patients, and one possibility is that he may be the culprit. Another is that he may have been framed by his lover's husband. The Hazelys are a complex family in more ways than one, and I would have found a family tree helpful to enable me to keep in mind all the different family members. One reason why Lorac may not have supplied a tree is that it would have spoiled one of her surprises, but I still think it would have been worthwhile. It's an interesting and fairly distinctive story, and although I prefer some of Lorac's other books, such as Murder by Matchlight and Bats in the Belfry, it is a decent, and at times atmospheric read.. The Broken Horseshoe is a thriller based on a serial by Francis Durbridge. The director, Martyn C.Webster, had a long association with Durbridge from the Thirties onwards, and was a key influence on Durbridge's radio career, while Peter Coke, who plays the police inspector in this movie, was one of radio's best Paul Temples. But this isn't a Paul Temple story. It's a stand-alone mystery, and it boasts some of the classic Durbridge hallmarks, although it''s not as consistently compelling as some of his later serials, in which his mastery of the cliff-hanger was so evident. The premise is a good one - a successful doctor operates on a man badly hurt in a hit and run accident, and become infatuated with a mysterious woman who has some inexplicable connection with the patient. The mystery woman (played by Elizabeth Sellars) persuades the naive doctor (Robert Beatty) to say nothing to the police after she turns up at the block of flats where the doctor has just found his former patient murdered. Obligingly, he discloses to her that the dead man had given him an envelope addressed to an unknown woman, and that inside it he has found only a railway ticket. In the flat where the body was found, someone has daubed on a mirror a picture of a broken horseshoe. The doctor's persistent foolishness is rather irritating, and tends to weaken the grip of the story. The plot hinges, as so often with Durbridge, on the antics of a criminal gang, and I didn't feel that the later development of the story fulfilled the promise of the set-up..There is a reasonable plot twist, but the acting isn't quite strong enough to allow us to overlook the shortcomings. Not bad, but by no means the best of Durbridge. Thanks to the wonderful channel Talking Pictures, I've caught up with the film of a book I wrote about in The Golden Age of Murder. And what a terrific period piece it is. I can't easily recall any film from the early days of the talkies that I've enjoyed so much. The movie is Death at Broadcasting House, based on the book of the same name by Val Gielgud and Holt Marvell. In the US,the book was called London Calling!, possibly because in its early days Broadcasting House wasn't well known on the other side of the Atlantic. I am lucky enough to have a copy of the American edition of the book, inscribed by Eric Maschwitz, who used the pen-name Holt Marvell, and is best known as the lyricist who wrote A Nightingale Sang in Berkeley Square. Like Val Gielgud, he was a BBC insider, and their know-how informs both the novel and the film. The film is, if anything, better than the book. It's a fast-paced story about a blackmailing actor who is murdered while playing the part of a murder victim in a mystery play for radio. There's a nice mix of suspects, and a good cast including Austin Trevor and the young Jack Hawkins. In one of a number of interesting cameos,the splendid Elisabeth Welch sings a song. The script is sharp, with some genuinely funny lines. But above all the film supplies a great insight into the early days of broadcasting. It's very watchable despite its age. Great fun.